Is this what it’s all about? Bagging a mountain? Over 100 years ago, the hill walker Hugh Munro, listed, then climbed 279 of the 280 Scottish peaks higher than 3000 feet above sea level. They became known as Munros. He was saving the highest till last but miss-timed his run; he died at 63. Since then, it has become a popular hobby among hill walkers. Several people I met in Scotland a few years ago, proudly told me of the number of Munro’s they had bagged during weekend trips. But Scottish peaks are in the little league compared to the Himalayan giants that stretch up ten times higher to the sky. I resist the ‘bucket list’ concept, from the film of that name, because it reduces life to a mad scramble for things to ‘complete’ while the King of Karmic Justice, Yama weighs up whether I’m rebirthed as a frog or a Prince. And yet here I am sidling up to the Mother of the Universe — Sagarmatha to the Nepalese — Chomolungma to the Tibetans, but named Everest by the British after their surveyor general in India. Just like Jack Nicholson and Morgan Freeman’s characters Edward and Carter, I’m hoping to witness something truly majestic. But this morning, just like in the movie, all I see is clouds. Boyhood fantasies of climbing to the top of the world; approachingthe gods. Cliches? Or a reality? For here I am sitting cros legged at dawn beside Kamal ‘omming’ to Kali, the primordial Hindu goddess of time and death. 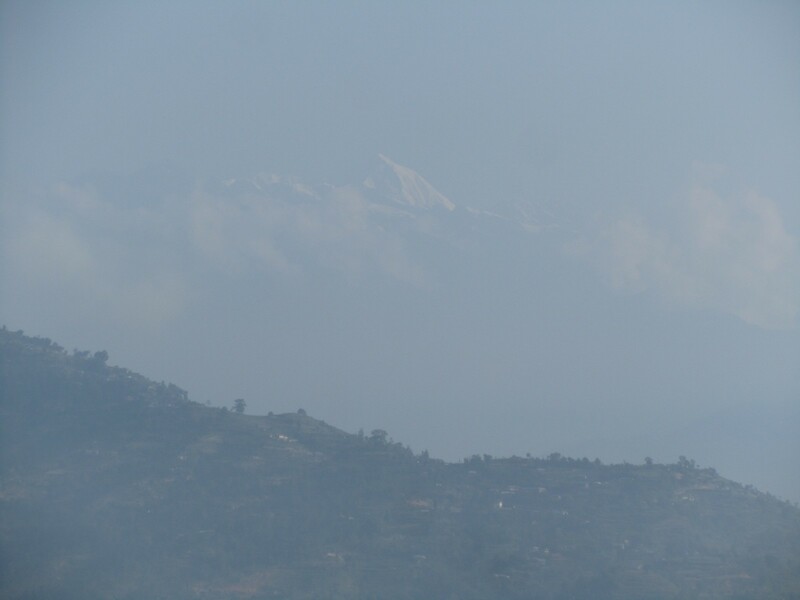 I’ve climbed to this hill in Dhulikhel, next to our mountain resort in an abortive attempt to see the sun highlight the Himalayas, but have been invited to join in the morning devotion of three locals. There is just enough room in the tiny shrine for two of us to sit in front of a stone image of Kali. It’s just a normal part of Kamal’s life. He and his two youthful companions Bijay and Rijendra were on their way to work on the earthquake ravaged road. Kamal has an easy presence and I imagine him as the ‘old timer’ in the work crew. I later discover he’s a year younger than me and I’ve been retired for 13 years. Bijay and Rijendra sprawl outside on the grass — chatting, checking their mobiles, laughing. Rather than being distracted, Kamal occasionally breaks off from his mantra and his deep chesty breaths to turn and join the lad’s conversations. Earlier, Bijay had handed me two wicks and lit them with his cigarette lighter. 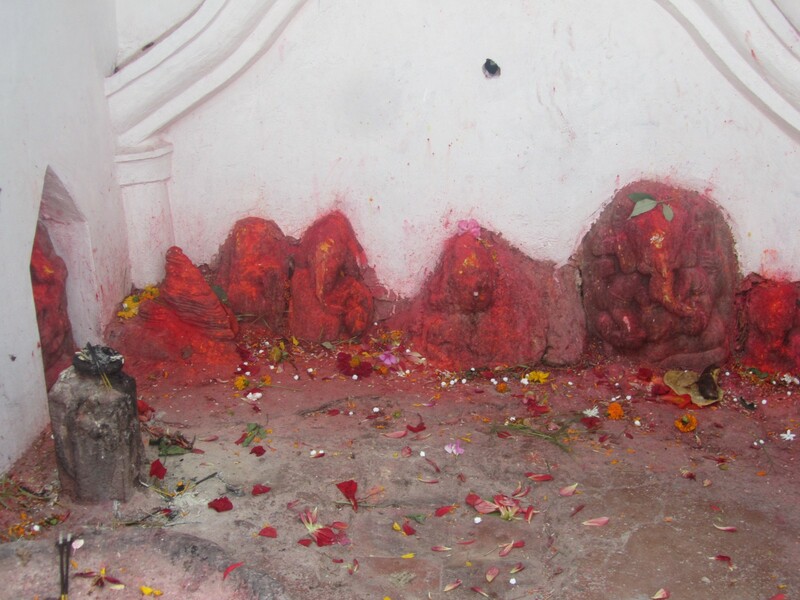 We had circled the shrine, then placed our smouldering wicks in a bowl at the entrance. Kamal had taken off his shoes and entered. Just this stentorious breath from my companion…….. Blossoms, red ochre and cleansing water. To be captured on a Chinese scroll. I’ve been to Everest and back. I am an egg-shaped rock, a boulder shaped in a time when rain fell in metres a year instead of centimetres as it does now. I am being rolled along by the mighty Yarlong Tsungpa river — returning me towards the sea from where I came fifty million years ago. As part of the Indian Plate I crashed northward into the Eurasian Plate and was warped up to form the biggest bulge the earth has ever seen. My home plate is still pushing north by the breadth of two fingers each year — that bulge is not likely to weather away. As part of the cataclysm I was squashed, heated, metamorphosed to a fine crystal matrix. 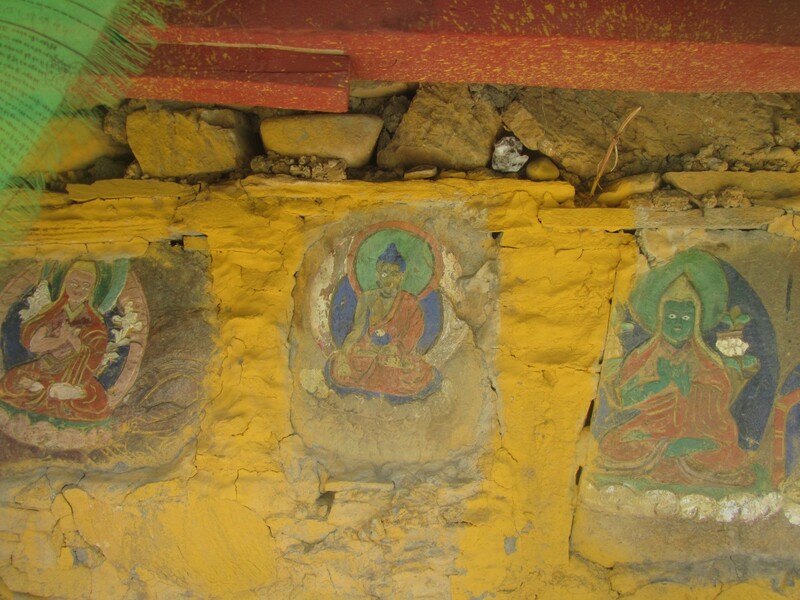 When those above me wore away, I surfaced at the mountain ridges, broke off and tumbled into the raging Yarlong Tsangpa. My edges wore off as I rolled and smashed against my brothers and sisters. This river has shifted backwards and forwards across the floodplain and left me here exposed. I was OK till The Friendship Highway undermined me. Now I perch with my head hanging out over the netted wall of the road cutting staring down at the terrified faces of eleven Australian tourists motoring by on a writer’s journey, wondering if I’m going to have a great fall off the wall onto their bus like a giant Humpty Dumpty. 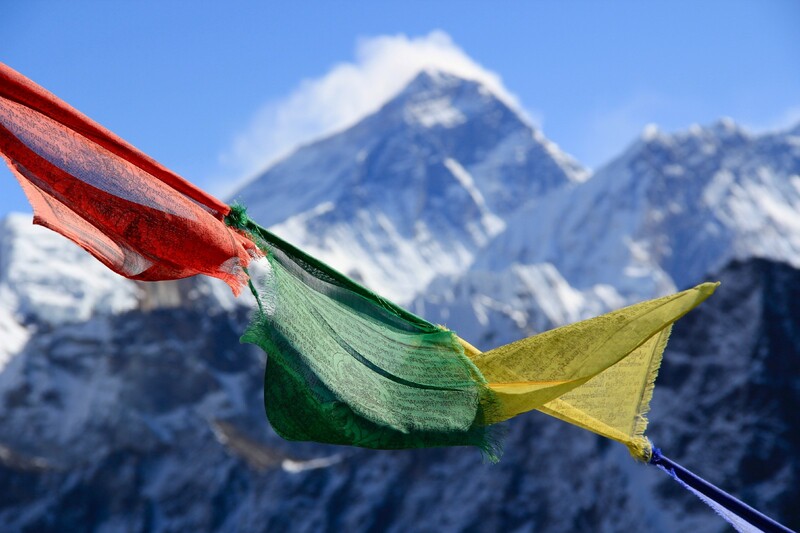 “To us its Sagarmatha, the sacred peak. And over 100 have died trying. 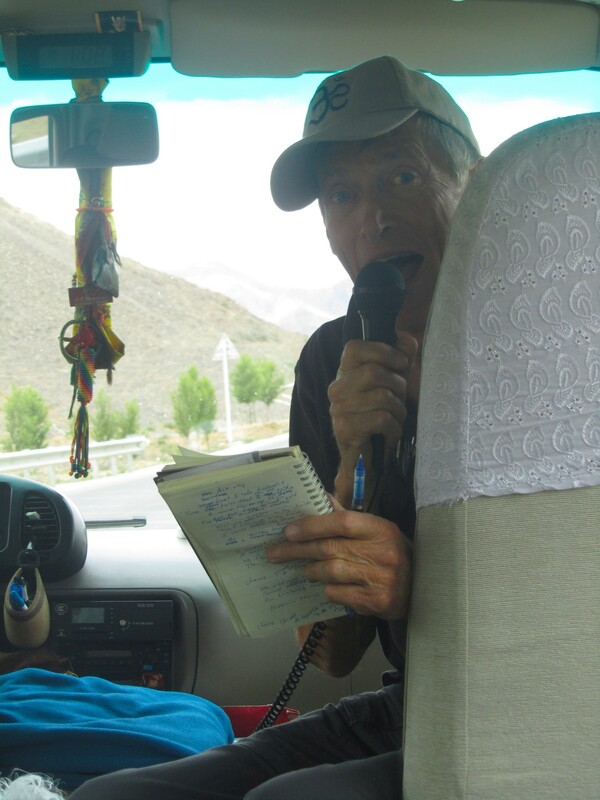 Don entertaining us on the road in Tibet with a song hot off the press. Donald Yates lives in Daceyville, Sydney. He writes songs and poetry, performs in poetry slams and is currently working on a memoir and was a writer/traveller on Taste Of Tibet 2017. Photos by Jan Cornall except where indicated. Enjoyed this? Hit the heart 💚 so others will find it too! Backstage Bali, Oct 14–21, seven days, mountains and ricefields retreat. Moroccan Caravan, Mar 4–17, 2018. A camel riding/writing adventure into the Sahara. Add on a five day residency at the end. Haiku Writing in Japan, Mar 27- April 3, 2018. Walk the Nakasendo Way in cherry blossom time.